This report focuses on data gathering, analysis, and dissemination challenges and opportunities across the homeland security enterprise, looking especially at how improved information sharing could enhance threat prediction and prevention in a transatlantic context. The authors address how stakeholders in the U.S. and Europe can increase the understanding of effective ways to leverage channels involving technology, human capital, organizations, and private sector coordination that meet strategic, mission, and operational needs. 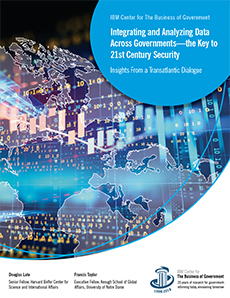 The report highlights opportunities for governments to leverage data integration and analytics to support better decision making around cyber and homeland security. Read the Infographic of the report. Download the Prezi presentation for the report. Read the article in Government Executive about the report.